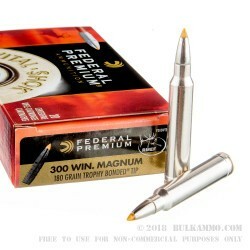 This 300 Win Mag cartridge by Federal sports a 180 grain Trophy Bonded Tip projectile. 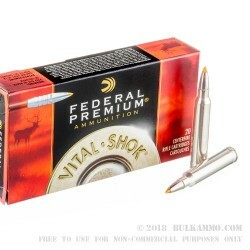 The bullet features a high-performance polymer tip for flat trajectory and better accuracy, robustly bonded jacket and core for optimal weight retention, exterior skiving for maximum expansion, and solid shank for deep penetration, even through thick hide and bone. This round also features Federal’s Gold Medal centerfire primer, which is manufactured with high quality components and extremely tight tolerances to provide reliable ignition with every trigger pull. 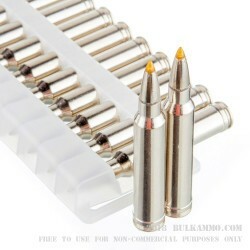 Its reloadable brass casing sports nickel plating, which both protects it against corrosion and facilitates smooth feeding and extraction. The round’s specially formulated propellant contains copper-reducing additives, so it will keep your bore unfouled for longer in between cleanings. 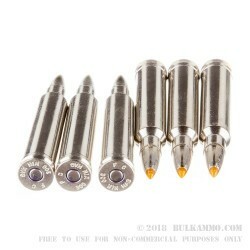 With its 2,960 fps muzzle velocity, this is a cartridge poised to let you take bucks down clean and fast, every time!